Buy and sell recommendations are emailed to our clients for their chosen stocks during the middle of the day – to be actioned that day. Each buy comes with a price or price range. Each sell comes with timing – not a price. Currently there are 75 Australian listed stocks to choose from and Programmed Maintenance (PRG) is one of those. 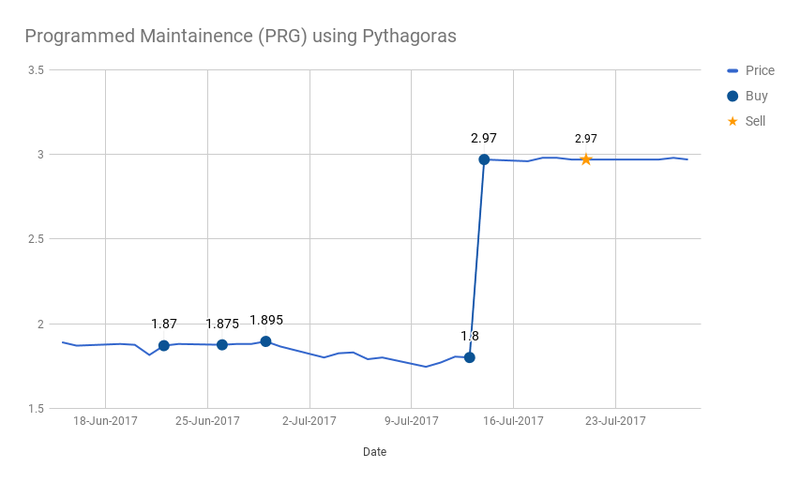 In today’s blog we explain how Pythagoras recommendations worked for Programmed Maintenance (PRG) leading up to a critical event. There were 3 buys in a 7 day period – we have summarised them below. The client would then continue to wait for the next recommendation. The next buy recommendation was on 13/7/2017 at $1.79. Then another buy on the 14/7/2017 at $3.01. On the very same day as the last buy (14/7/2017) there was an announcement by the company that it had entered into a Scheme Implementation Deed with a company called PERSOL holdings to buy 100% of PRG for $3.02. An event! No-one else can mathematically predict share price behaviour and act in advance of a share price event! 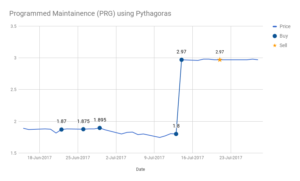 Unlike all its competitors, Pythagoras is not re-working pre-existing information. This is entirely new knowledge using logic that has not previously been known, understood or available which gives you the opportunity to be ahead of the market using our revolutionary mathematically precise, predictive technology. A subscriber to this stock would have bought 5 times and received a sell recommendation on 21/7/2017 at $2.97. Summarised below is the sequence of buying and the sell recommendation. Its wildly profitable! We have graphically represented these to aid your understanding. Given the price reaction, the takeover came as a shock to the market. In contrast Pythagoras Volatility was all over it – having bought 5 times ahead of what was a significant event. The average buy price would be $2.07 for the 5 buys over the 3 week period. Upon selling they would have made 41% return, in 1 month! Quite remarkable I am sure you will agree. Our predictive technology takes a complex snapshot of each stocks historic performance and measures volatility, allowing us to predict events that will affect the stock price. For Programmed Maintenance this was a takeover – but there are a multitude of events which affect share prices of stocks every day. We have simplified investing, making it manageable even for casual investors. We give you back freedom from watching and worrying about the market!